Baseball season is in full swing at our house, and when that happens, I am all about quick, easy and delicious meals. 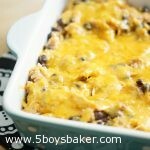 This Cheesy Chicken Enchilada Rice Bake fits into that category perfectly. I bought the beloved rotisserie chicken at Costco the other day and so this is what I came up with for dinner. To be honest, I wasn’t sure how it was going to turn out, so I wasn’t planning on posting it. But that changed when we all tasted it and declared it blog worthy and so I had about 3 minutes to try and take pictures before my boys became ravenous beasts. This meal is fast, tasty and totally loaded with goodness. It’s not fancy, you most likely won’t see it on the menu in a 5-star restaurant, but it is delicious and is total comfort foo. Even your pickiest eaters will like this and may even ask for seconds. 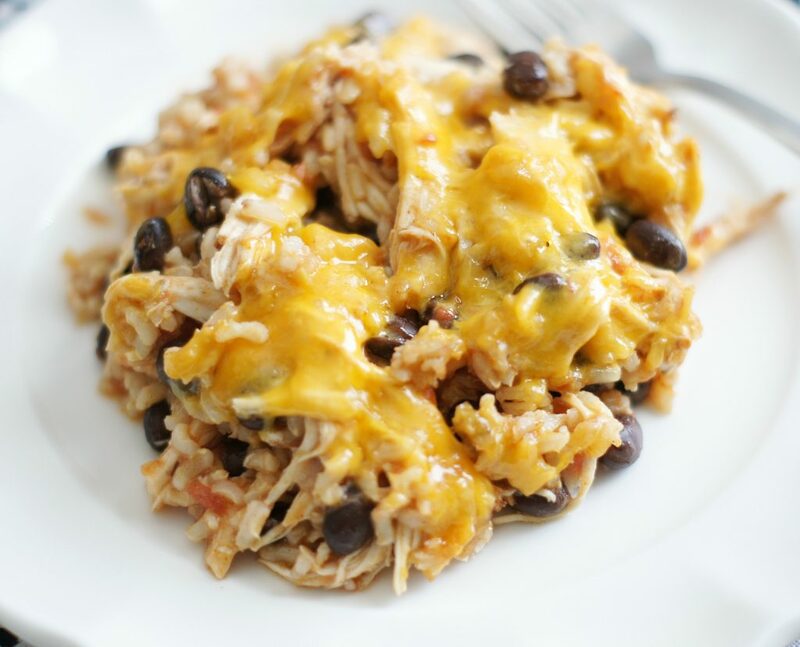 This Cheesy Chicken Enchilada Rice bake is so simple to throw together and tastes amazing! Dinner on the table in 35 minutes . . .you gotta love that! Preheat oven to 350 degrees F. and lightly spray a 9x9 deep dish casserole pan or other large casserole dish with cooking spray. In a large bowl add cooked brown rice, enchilada sauce, chicken, tomatoes, black beans, cumin, salt, pepper and. Stir to combine all ingredients. Spread into prepared dish and bake at 350 degrees for 20 minutes. 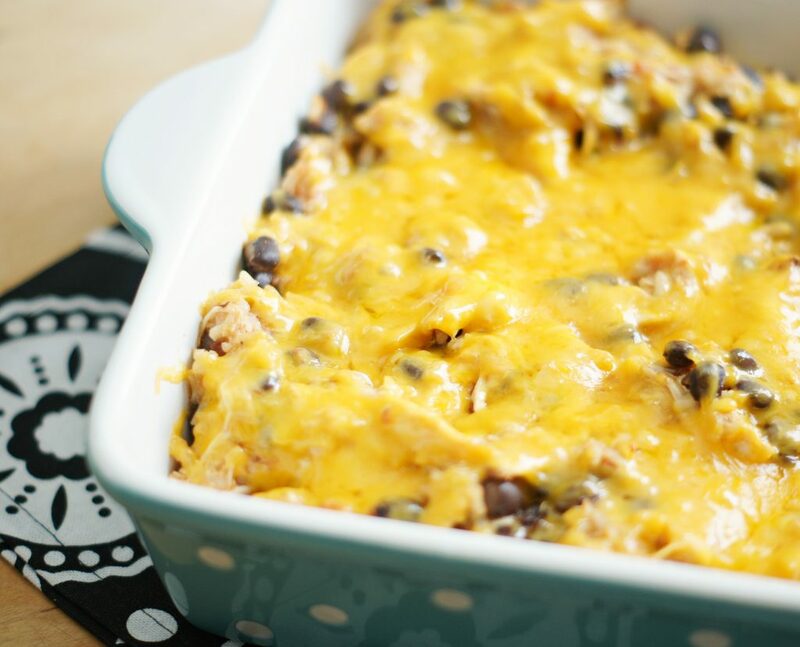 Remove from oven and top with shredded cheese, bake for 5 more minutes or until cheese is melted. Loved it and Gary loved it! Had to make some adjustments….used an Uncle Ben’s rice pack, not big enough for the three/half cups of rice, so I added some Panko to absorb the extra juices…OK. Used chicken breasts cut up in chunks…OK. Had spicy enchilada sauce…OK. All worked out good. Lots left over for another time…just the two of us… Definitely a do-again! Thanks, Jodi!!! Thanks Annie! So glad you guys loved it! I wish we would have had leftovers! !